With our wide industry experience and expert knowledge, we are known as nonreturn valve supplier, manufacturer, and exporter in India. This supreme quality of valve is made by our experts using best quality components and latest technology. Nonreturn valves are used for flow of fluid in one direction and preventing the flow in reverse direction. These valves are checked and pass through many quality parameters to ensure, only pure and defect-free valves are dispatch from our manufacturing unit. Our offered valves are widely used in the prevention of reverse flow of pump water. They are simple type of direction control valve used in hydraulic system because they can stop fluid flow in given direction and allow flow in another direction. They are also used as a bypass valve and protect different hydraulic components against high pressure. They are very effective in decreasing hammering effect in pipelines further they have a minimum of head loss, quick closing operation and nonslam characteristic made them highly demandable in the global market. They are also known as check valves. Many nonreturn valves are spring loaded and using a plate for sealing of fluid flow in a given direction. Plates, puppets, and balls are used as an isolating element. Our special type of nonreturn line rupture valve prevents the piston from coming down under the condition of line rupture and hence prevents the chances of an accident. Proper fitting of non return valve in a piping system ensure that fluid flows in the given right direction, otherwise pressure conditions caused a reversed flow. There are different types of non return valves are available in the market such as swing type, clapper type, pilot operated, shuttle valve or spring loaded valve. Pilot operated valve permits flow in given direction as per signal of external pilot pressure. Similarly shuttle valve allow free fluid flow operation at high pressure. 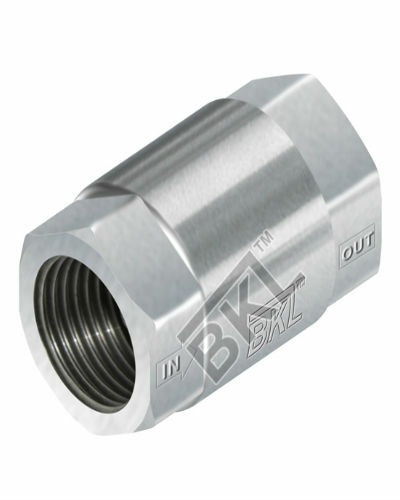 These non return valves are also useful in cooling and heating system to prevent reverse flow. As a well known non return valve supplier in India, we have extensive expertise of designing and making valves with different size, measurement and configuration. We consider hydraulic and functional requirements of different industries before manufacturing specific range of non return valve. Customers can avail best non return valves from us at discounted rates for their various applications.